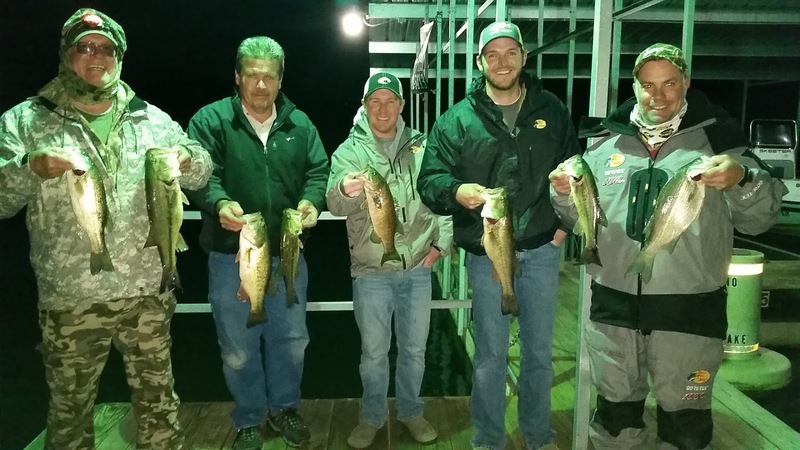 The term "March Madness" definitely fits Norfork Lake this month. 3 inches of snow a week ago, 90 degrees yesterday and some thunderstorms and cooler weather on the way. 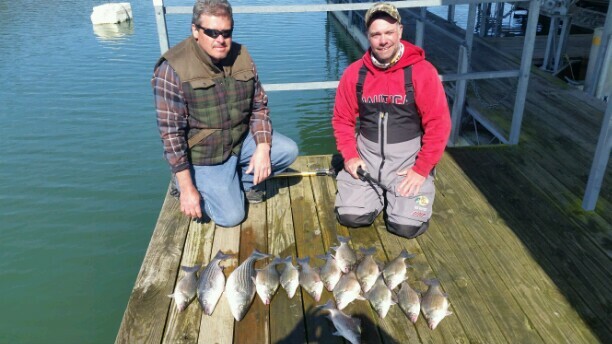 The changing weather patterns play havoc with the fish, but today the fish gave signs of getting back on track. 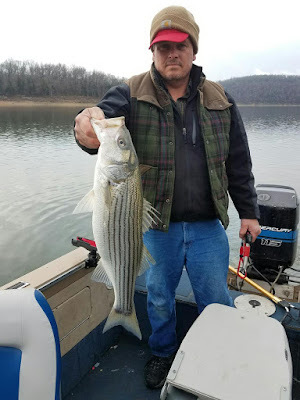 I saw sporadic surface activity for largemouth bass and striped/hybrid bass, crappie moving in tighter to the banks for their pre-spawn activity, and the white bass and walleye have started to move out to the flats which indicates the majority of the walleye and whites have completed their spawn. Today was a very interesting morning of fishing. 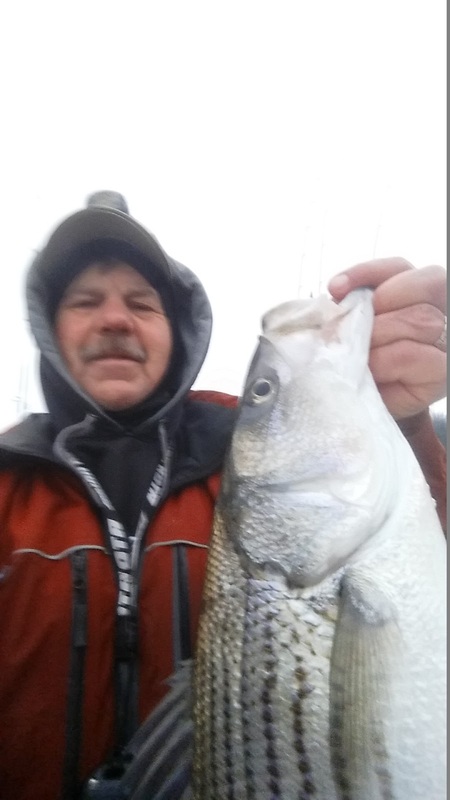 My game plan was to search a different area of the lake for striped bass. I didn't find striped bass, but I ended up catching fish on 5 different types of baits. In the dark I started casting a suspending stick bait to the shoreline. I landed largemouth and crappie on my Smithwick Rogue. As the sun was coming up I casted out my blade bait, Kastmaster, and landed some whites. As the morning wore on I started casting out a paddle tail swim bait to the shoreline and landed a largemouth, then in deeper water I dropped a spoon and landed a walleye. Live thread fin shad landed a second walleye and I broke off a big fish, maybe what I was looking for. 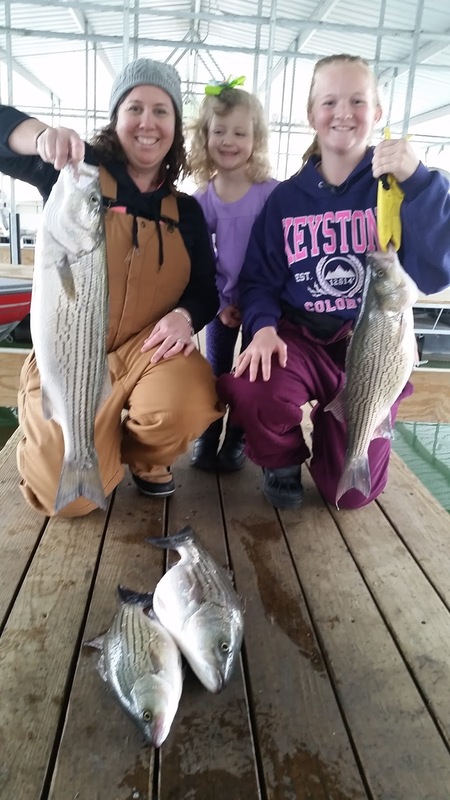 Striped bass fishing the last couple of days has slowed with the cool system that rolled though our area last week. 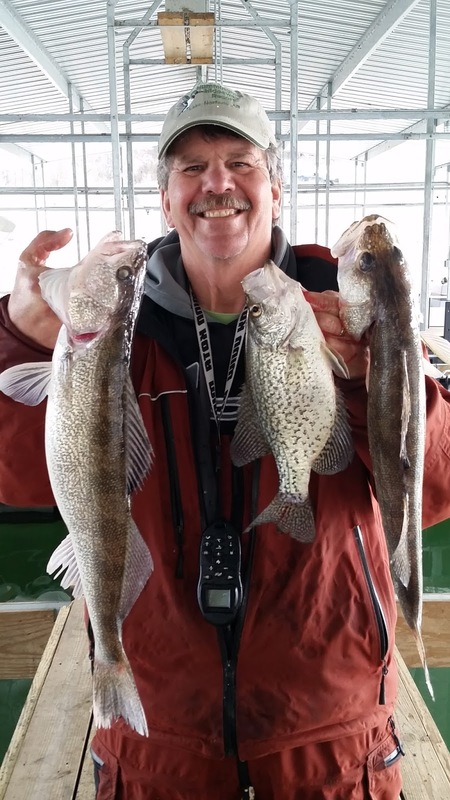 The snow and cold temperatures dropped the surface lake temperature from 56 degrees to 50 degrees. This morning the lake had warmed back up to 56 degrees. 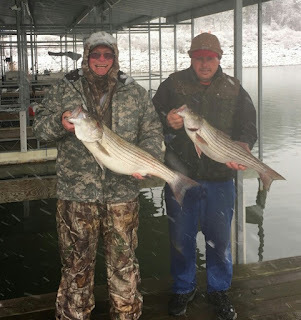 A few days ago the stripers that had moved back into the major creek arms were biting aggressively and could be found anywhere from 20 feet of water to 50 feet of water. 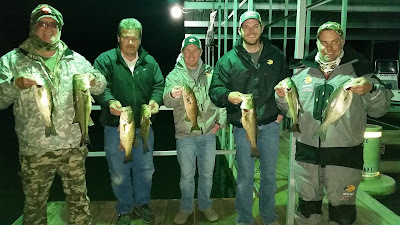 Most fish that I was catching and marking were suspended 15 to 35 feet down. Yesterday I did mark a few stripers, but they were not feeding. This will change with the warming water very shortly and the good bite will begin again. Largemouth bass fishing has been good. This species is moving in close to the shoreline early and late in the day. This morning brought some of the best surface activity that I have seen so far this year. This is still early for topwater, but a very good sign. This morning I caught largemouth before sunrise on a suspending jerk bait, as well as, after sunrise largemouth were being caught on a 5 inch paddle tail swim bait by one of my guests. The topwater started just as the sun got above the horizon. Start carrying your favorite topwater bait as I believe this will become a little more common each day. Alabama rigs are also working very well rigged out with a 3.5 to 4 inch swimbait. The shorter baits are still working a little better than longer baits, but this will change as the water continues to warm. 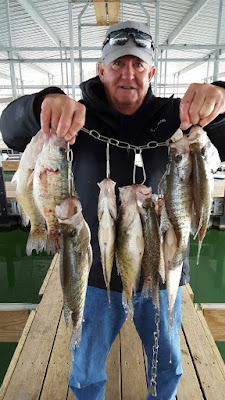 Crappie fishing is becoming very good. This species is in their pre-spawn mode and can be found in very shallow water as well as on 20 - 30 feet brush piles. Cast out a small paddle tail grub or small swimbait to the shoreline. Let it sink to the bottom and reel back to the boat. Small spinners will also work. Today one of my guests had a great morning of crappie fishing. He found fish stacked in and over 25 - 35 feet brush piles. He was vertical jigging with a spoon. Only 4 of the 11 crappie he kept had eggs in them. I am not sure if some of the crappie have already spawned or not. If you find some sunken brush along the shoreline that is exposed, fish this brush as it will be holding crappie. I caught walleye this morning, one on a shallow flat in 18 feet of water and the other was out in 65 feet of water suspended down 55 feet. I marked bait from 40 feet to the bottom and saw 5 big arcs in the bait. I assumed the arcs were stripers so I dropped a 1/2 ounce spoon and landed a nice 23 inch walleye. You tell me what the current pattern of our walleye are? :-) The majority of the walleye have spawned and should be moving to the flats to feed. Deep diving crank baits, crawler harnesses and dragging live minnows will start to pick up some nice fish. White bass have also completed the majority of their spawning activities. 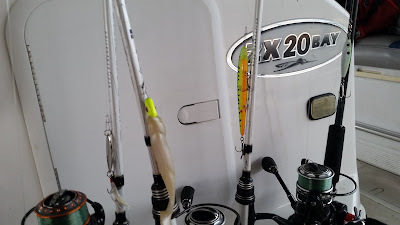 I am starting to find scattered fish on large flats suspended down 20 to 30 feet in 30 - 50 feet of water. I caught several nice whites on my Kastmaster bade bait. It will not be long until large schools of whites will be roaming shallow flats feeding heavily on shad. Topwater frenzies will erupt and make the water boil. Topwater baits, blade baits, spoons and swim baits will all pick up some nice fish. Norfork Lake surface water temperature this morning was 55 - 56 degrees. The lake level is falling very slowly and currently sits at 545.25 which is approximately 1 ft drop over the last 2 weeks. The lake is somewhat stained but clearly is occurring.